FLIGHT OF THE INTRUDER. Stephen Coonts. Brilliance Audio. Flight of the Intruder stands as one of the twenty top-selling novels of all time. An instant classic that brings the Vietnam War and combat aviation alive, Coonts’ story is notable for its crisp pace and layered characters (namely Jake Grafton) who grab hold and refuse to let go. Read by Benjamin Darcie, whose rich voice serves as the perfect vehicle for this rock-em-sock-em action thriller. ALL I NEED IS YOU (An Over the Edge Novel). Julia London. Brilliance Audio. London’s book leaps and waltzes, this love story that is part soap opera and part modern-day tragedy. Readers will be intrigued by the raw reality that shapes the characters and by the plot that sheds its skin in layers. Cliched as it might sound, once you start listening you can’t stop. Expertly read by Renee Raudman, whose delivery aches with sensuality and intrigue. PROTECTOR. Diana Palmer. Brilliance Audio. Set in Texas, Protector evokes Elmore Leonard’s world of true crime, following lawman Hayes Carson on his quest to find his brother’s killer. Along the way, we are introduced to a cadre of characters who, at their finest moments, reflect pieces of each of us. Read by Eric Dove. RASPUTIN’S SHADOW. Raymond Khoury. Penguin Audio. This historical novel is truly a thrill-a-minute ride. Set in a 1916 mining pit in the Ural Mountains, we’re enveloped by the scent of paranoia as the miners suddenly turn on each other and attack. And that’s only the beginning of the journey. Decades later, the search is on for why. But the answers are hardly easy in coming. Read by Richard Ferrone. BLEEDING EDGE. Thomas Pynchon. Penguin Audio. Pynchon is a name synonymous with literary excellence – his novels fiery and wholly original, gutting to the core. 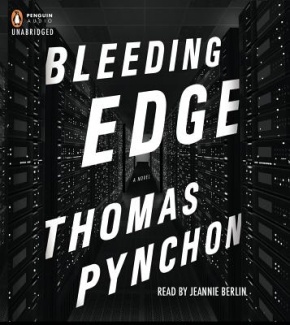 And Bleeding Edge continues the grand Pynchon traditions: Deep and winding plot; even deeper characters. In this one, we find ourselves in New York City in the early days of the internet, moving stride-for-stride with Maxine Tarnow as she hunts down the frauds who populate the countryside. Read by Jeannie Berlin in a smoky cool vibrant tone. EAT, PRAY, LOVE. Elizabeth Gilbert. Penguin Audio. This memoir is about guts and walking-the-walk, as Gilbert leaves behind her safe and ostensibly successful life in the United States to explore the cultures of three different destinations – Italy, India and Indonesia. In the end, Eat, Pray, Love is about bliss and reflection, about the courage it takes to connect with yourself. It’s a story that’s certainly worth a long look. Read by the author. This entry was posted on October 11, 2013 by Jacob Aiello in 2013, In the Spotlight, October 2013, Rat On Audiobooks and tagged Audiobook, Brilliance Audio, Penguin Audio.